I push the borrowed jogger stroller up our street. It’s been a challenging morning with so much whining, and I breathe deeply, letting the frustration fall as we build speed. I think again about how difficult it is not to sink too deeply into introspection with this daily writing and focus on right here, how I don’t want this to all be about me. I want to keep my eyes clear. I think about writing, about how I need to live and walk in order to convert the world of words I see into those others can read on a digital page. As we walk, I pay attention to the still nagging feeling (made more acute with how much writing I’ve been doing lately) — the one that still wonders why anyone would care to read about the daily mundane of a very unexceptional woman, mothering, wifing, trying to find her way. I push the jogger by the tall white church on the corner and see signs of a funeral in progress. The street filled with cars on a Thursday at midday, a woman dressed in professional heels who quietly tries to enter the double wooden doors. 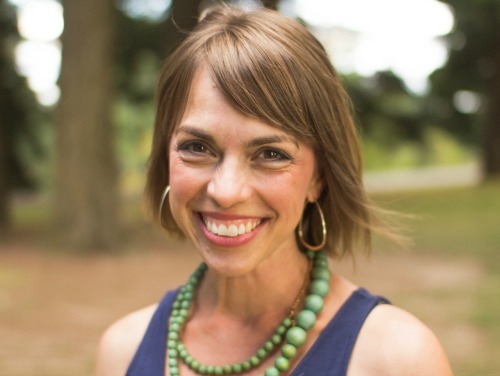 From inside, a woman’s voice finds its preaching rhythm. It is thick with experience and encouragement. “Our LIVES are our STORY,” she says. I let it sink in. They are the only words she speaks that I truly hear. We continue up the hill to a park nearby, and Lala and I are mostly quiet, talking some about the scampering squirrels and autumn leaves. Mostly we wheel along in silence. 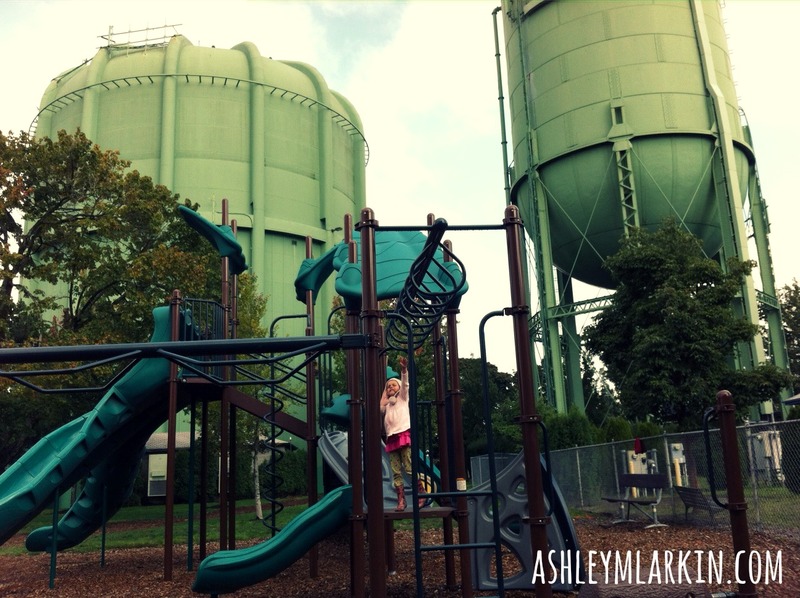 We approach the park, and though there are a few trees and a community garden on its east side, the park is none too picturesque with the massive water towers standing like giant behemoths at the north side. Then I remember that this park is one made by a community that took an eyesore and turned it into a place of laughter and running feet and swinging and sliding. Lala rises from the stroller, and I sit on the waterlogged wooden bench. She runs to the monkey bars, the pom pons on her rabbit hat swinging side to side, her smile a light beam that sears. She climbs up to the first bar, attempts to take her grip on the water spotted ring of metal. “They’re too slippery,” she says. I dry them with a towel I’d thrown in the stroller to sop up a pool of water and watch my five-year-old girl cross one bar at a time, over and over. Sometimes she falls and gets back up, wipes her hands along the metal uprights to give them extra grip like she’s seen her big sisters do for years. Other times she crosses from beginning to end, legs swinging, head bobbing, bark chips flying from her sweater. And it is so ordinary. And all kinds of beautiful. This is Day 4 of Right Here. Throughout October, I’m joining with a community of other bloggers (over 1,500 strong! ), who are writing for 31 days about the same topic. 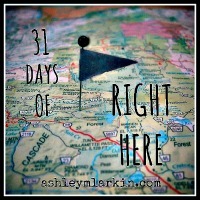 To find all posts in 31 Days of Right Here, click here or see the listing below. To continue receiving these daily words, subscribe to this blog on the sidebar at left, click here to Like Draw Near on Facebook or follow me on Twitter @AshleyMLarkin. I’m thankful to have you on the journey with me. Also linking up with the Five Minute Friday community at the lovely Lisa- Jo’s with the timely prompt: WRITE and quite a bit more than five today. It is a common question among us writer/blogger types, isn’t it, Kendra? :-) Thank you for adding your voice to the conversation here. Bless you. We have it all wrong, I think, dear one. What and whom the world considers important is not the the way our Pappa sees us. Remember the man in the region of the Gadarenes, amongst the graves filled with a legion of demons. Our Lord went there especially to heal and deliver him. Yes, indeed, Mia. God indeed sees the heart and not the outward appearance. Bless you, friend, for affirming the truth of the One Who Goes After and Heals. Haha, Karen! I’ve never thought about it that way, but you are so right. Thanks for the chuckle today. This post, too, is “all kinds of beautiful.” So glad to have found you through FMF. Now following. I’d love it if you’d visit me sometime over at Finding The Inspiring. God bless you! Angel, looking forward to visiting at your place, as well. Thanks so much for your kind words and for following along! I love how God calls us to stand in the very places we would never have envisioned ourselves standing. That is so much like God, no? It is with a chuckle and a “huh, how would’a thunk!”, that we rise from our bed, brush our teeth and go about our work, the work we never would have imagined ourselves doing, and yet the one that God calls us to….it’s called Vocation. So glad you listen to God, because I love hearing your voice! Thank you, Mama, for encouraging me along this growing journey of finding and releasing my voice. Love you. Ashley I take exception with your description of yourself as an unexceptional woman. I’ve known you well for a long time now and to me you are God’s best expression of exceptional. Thanks for being who God created you to be and for writing about your life and sharing your most intimate thoughts with me. You bless me. :-) Bless you, dear Barb. Thank you for cheering me on to be the me I am. You are so good at that. Our lives are our story, and we read other’s lives because we’re not meant to be solitary. Your words give me my words, sister, and you are exceptional at that. Thank you, Tresta. I’m amazed how often lately I read/hear that we write and read, both, to know we are not alone. It is so true, friend. Thankful for you. Love seeing the world through your eyes Ashley…it’s so extraordinary! I love journeying with you, dear Kelly. Your ending is beautiful. I love the short, single sentence paragraphs, as well as the artful use of a conjunction to start each sentence. I’m glad I found you here in your little corner of the world. Ruth, what a gift to read your feedback. Such a treat for a writer. Thank you for taking the time. A pleasure to “meet” you! Oh, friend, I’m laughing at your confession about your first response to blogging. I, too, sat in a writer’s conference years ago and checked off blogging in my mental list of “nevers”. Umm, I guess sometimes God laughs at our “no’s” and overrides them with His “yes’s”. So glad we both changed our minds so we could meet each other in this wild world of blogging. I’m loving your series RIGHT HERE! I love you and your “all kinds of beautiful” and “ordinary.” Thank you for this reminder. It is a challenge I wrestle with continually, not to sink too deep into introspection with the kind of writing I do, too. I appreciate how you are continually seeking to clear your eyes and see the stories going on around you. Friend, how I know that struggle. Glad to be in this with you.